Please note the Date and Time you are picking up. name, first initial. This is the order number. These changes would need to apply to all order forms, but still currently revising them. The best solution I can come up with at the moment is to rearange the fields like this. A number of changes were made to achieve this result. 3. Click "Options" in the toolbar, select all of the text (Ctrl+A) and paste (Ctrl+V) what you copied to the clipboard in Step 1. 7. Remove most of the text of the label of the date field, leaving just "Enter the Date and Time you are picking up:"
10. Return to the tab/window containing the clone and click the equivalent field, then click "Edit HTML"
15. When the HTML Source Editor window loads, paste the text copied in Step 12., click "Update" and then click "Complete"
Incidentally, you will discover that Firebug can be used to determine the CSS that needs injecting to adjust various other parts of your form not mentioned. CSS comes in. Do you have an example? Will wait for the CSS code. To simplify matters, I have taken the liberty of copying a totally functional clone of your form from my account to yours. To avoid any confusion, I have given it a pink background so that you can easily distinguish it from your original. 2. While on the "General Settings" tab, click "Enabled", change it to "Disabled" and click "Close Settings"
To enable my clone, follow the same procedure, except that you would change "Disabled" to "Enabled" in Step 2. Please let me know how this all turns out and feel free to ask our team additional questions about JotForm forms. We would be happy to assist you. the way you highlighted the bakery name/address and liked your wording. When you work on something for so long, a fresh set of eyes is helpful. first initial. This is order number (ID). 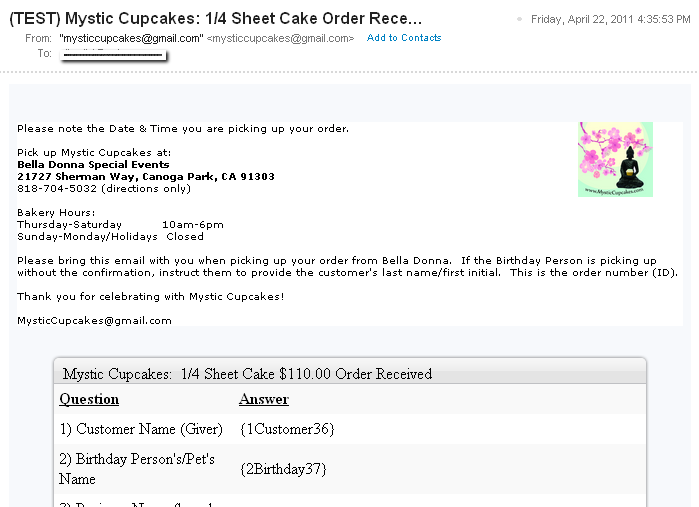 Thank you for celebrating with Mystic Cupcakes! Kindly try it on the other email templates and let us know if it works or not. You're welcome, Monique! We're glad to hear that its now fixed.